Life Flight nurse Kathie Reyes explains the interior of a Life Flight helicopter while using a mannequin from a mock ATV accident during Farm Safety Days held at Dale Gerding Farm in Ottawa. Students learned about safety regarding tractors, electrical, water, lawn mowers and chemicals used on the farm. Students learn about electricity through a demonstration by Paulding Putnam Electric Cooperative. Luke Schroeder, 10, center, calls 911 during a mock ATV accident using a mannequin during Farm Safety Days held at Dale Gerding Farm in Ottawa on Tuesday. Students learned about safety issues related to farming. Left is Nancy Erhart, Putnam County EMS Chief, and Ruth Gerding, his grandmother. OTTAWA — More than 500 third graders from Putnam County schools learned Tuesday about farm, water, chemical and gun safety first hand on the Dale Gerding Farm in Ottawa. It was the 20th year for the Farm Safety Day that was started by Dale’s wife Ruth, who worked at the Putnam County Health Department. Putnam County Sheriff’s Office officials taught the children about gun and water safety. Rick Thornton, Putnam County deputy sheriff, showed the students a video on gun safety. Students learned water safety skills and about wearing a life jacket. They also were shown tools such as garden hoses and rope they could use to save someone who was drowning. “Sometimes guns are in homes in places they shouldn’t be. Our message to them is if they see a gun to stop, not touch the gun and tell an adult,” Thornton said. Jason Hedrick, OSU Extension, partnered with Putnam County Soil & Water Conservation to discuss grain bin, chemical and lawn mower safety. He used a makeshift grain bin to show how a person can easily get trapped in the bin. Empty jugs were covered with an invisible glow powder and when the lights were shut off, the powder was activated by a black light. Students learned how chemicals can transfer. “Our goal is to give them an opportunity to learn that chemicals can be transported from the fingers to other parts of the body and teach them how to learn how to read labels on chemicals,” Hedrick said. In the station, they learned about being safe around hopper wagons and grain bins and that people drown in them every year. “A lot of kids may not live on the farm but have grandparents or friends that do, and we want to educate them on dangers they may not know about,” Hedrick said. Mercy Health had a table set up with various chemicals such as dish soap and windshield washer fluid that looked like different colors of Gatorade that also were on display. Stephanie Pierce, Mercy Health emergency room education coordinator, encouraged students if they didn’t know what liquid was in a cup to dump it out and get a new cup. They also learned about being safe in the sun by wearing sunscreen and learned that a 30 SPF or higher is recommended and should be applied to the skin every two hours. Each child was given a bracelet that changes colors when they are exposed to ultraviolet rays. They learned about keeping themselves covered with hats and sunglasses. 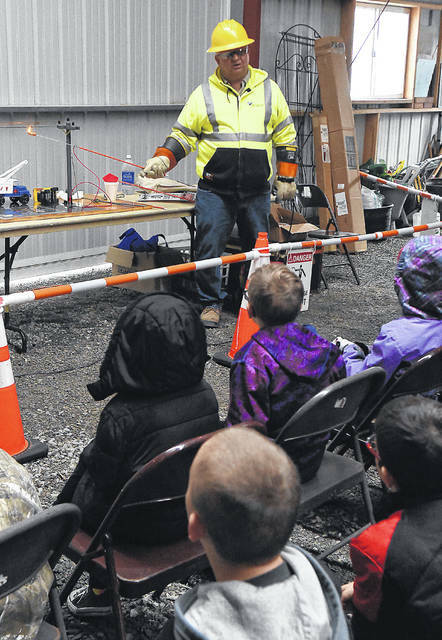 Paulding Putnam Electric Cooperative taught students about how to be safe around electricity and to stay away from wires, trees near wires and to not fly a kite near power lines. 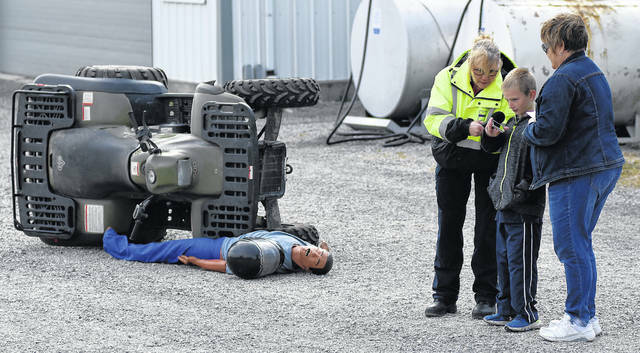 A mock ATV accident was staged where a mannequin was trapped under the ATV. 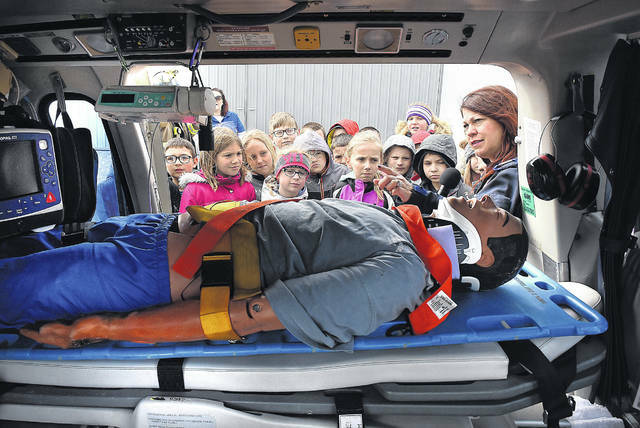 Students watched as Putnam County Sheriff’s Office, EMS, Glandorf Fire Department, Ottawa Fire and Rescue and Putnam County Emergency Medical Service responded. A student practiced calling 911 and the emergency units and the Life Flight helicopter from Mercy Health responded to the scene.